DeMarcus Cousins' thigh injury is "pretty significant" and the center will be sidelined for "a while", according to Golden State Warriors head coach Steve Kerr. 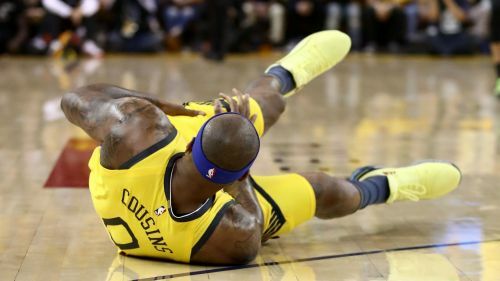 Cousins suffered a quadriceps injury in the first quarter of Game 2 of the Warriors' playoff series against the Los Angeles Clippers after he fell chasing down a loose ball. The four-time All-Star did not return and the Warriors threw away a 31-point lead as the Clippers completed the biggest comeback in NBA playoff history to win 135-131 and level the Western Conference first-round series. It is the latest injury setback for Cousins, who only returned in January after missing a year with a torn Achilles that he suffered while playing for the New Orleans Pelicans in 2018. Speaking about the problem Cousins sustained on Monday, Kerr told a news conference: "There's a pretty significant quad injury. "We'll get an MRI [on Tuesday] but he's going to be out for... I'll just say a while because I think it's unclear right now how long he'll be out. It's significant." Cousins' team-mate Stephen Curry said the timing of the injury was particularly cruel.